The American Stars and Stripes and the yellow-and-red flag of the Republic of South Vietnam will fly across California this week as many of the 2.7 million Vietnam War veterans join 1.7 million Vietnamese-Americans in remembering the 40th anniversary of the Fall of Saigon, which took place on April 30, 1975. A crowd of about 10,000 was expected at a Camp Pendleton Marine Base commemoration, but the U.S. government refused to allow the South Vietnamese flag to be flown on a U.S. facility. Organizers moved the ceremonies to several locations in southern California. Since about 50,000 Vietnamese spent their first days in America at the Marine base as refugees from the communist take-over in 1975, the Fall of Saigon organizers had worked for months preparing for a solemn remembrance at Camp Pendleton. But Jason Johnston, director of Public Affairs at Marine Corps Installations West-Marine Corps Base Camp Pendleton, announced on April 10th that Marine Headquarters officials told the base command that flying of flags – or the singing of any national anthems – representing countries the United States does not recognize is not allowed at federal installations. The commemorations will begin on Saturday in Garden Grove at Bolsa Grande High School’s football stadium. Spokeswoman Sophie Tran expects the event will draw about 1,000 people. The gathering will feature a “photo-homage” to the “Boat People,” who escaped during and after Vietnam’s fall on rickety, often dangerous, vessels. During a two-hour ceremony in San Diego on Sunday, two wreaths will be tossed into the Pacific Ocean from the retired USS Midway aircraft carrier. One wreath will honor the American service members who died during the war, and the other wreath will honor the South Vietnamese who lost their lives during almost 25 years of the conflict. As Saigon was falling to the North Vietnamese Army, the USS Midway led Operation Frequent Wind that evacuated the last Americans and 125,000 “at risk” Vietnamese from Saigon. Most South Vietnamese feared the type of reprisals conducted between 1957 and 1973 by the National Liberation Front that included approximately 36,725 assassinations and 58,499 abductions of South Vietnamese. The massive assembly of American aircraft and ships accomplished the largest helicopter evacuation in history. USS Midway organizer Roxanne Chow said, “It will be a solemn but meaningful experience.” Volunteers are tying 58,202 yellow ribbons onto the flight deck to honor each of the fallen American service members. 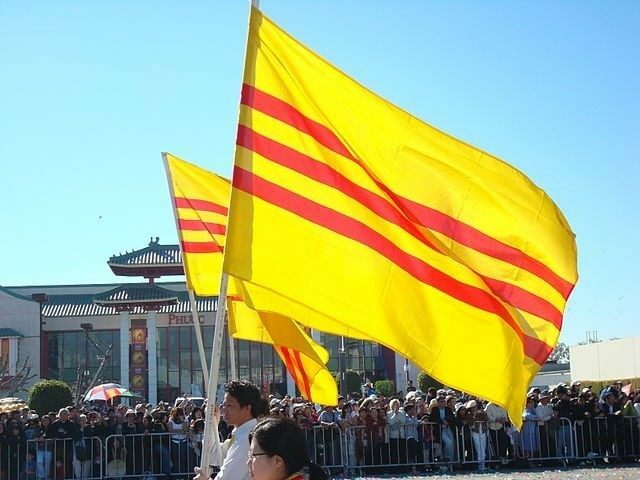 Organizers will pass out small flags to the attendees: 5,000 American ones and the same number of South Vietnamese flags. The largest “Black April” commemoration will be held on Thursday, April 30th. Up to 5,000 attendees will meet in the heart of Orange County’s “Little Saigon” for a three-hour ceremony beginning at 6 p.m. at Sid Goldstein Freedom Park in Westminster. There will be a candlelight vigil, the clasping of hands to show unity with the people still in Vietnam, and a slideshow displaying pictures of the approximately 50 South Vietnamese military officers who committed suicide during the Fall of Saigon.